Through survivor's testimonial books, I was able to learn about the atrocities the Nazis committed against the Jewish people, the Gypsies, the homosexuals, and the handicapped during the Holocaust. I also saw photographs taken in the ghettos and the concentration camps. Long lines of naked women, many of them holding their babies, on their way to mass execution. Mountain os corpses of men, women and children before they were buried in a mass grave dug by the Germans and oftentimes by the victims. Gas chambers, pipes, ashes. . . all these images speak very loudly about that massacre. 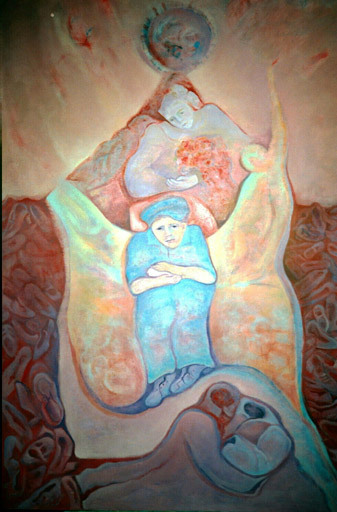 In my canvas "Rebirth: From the Broken Wires,"(left) I tried to catch the bittersweet expression on the faces of young survivors, whose photographs were taken the day of the liberation by the Allied forces. Through the broken wires of that inferno, a promissory sun arises, while in the background there is a sad landscape, composed by a texture of brushes. Before murdering the victims in the concentration camps, the nazis, applying systematic plunder, confiscated all their belongings. First they took money and other valuables and after that articles needed for daily living: clothes, shoes, glasses, and brushes which were gathered separately and later sent to German settlers. 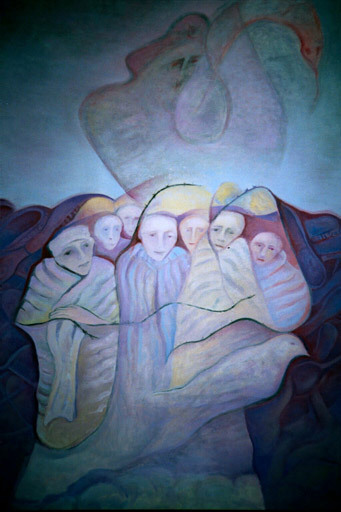 "Rebirth: From the Black Flower"(right) alludes to the spotlight in the main tower over the entrance to the unloading ramp at the Birkenau concentration camp. Under its light rolled the trains taking the Jews to death. People used to call it The Black Flower of Brzezinka. I painted a child who was able to survive by hidding in the forest. He stands between a butterfly's wings, which was in the camps a symbol of lost freedon. Above the child, there is a girl dressed in a communion gown. Some Jewish parents saved their children by leaving them with Christian families.